Making sour cream at home is both easy and rewarding. It contains no additives, no fillers or thickeners, and there is no plastic tub to discard. 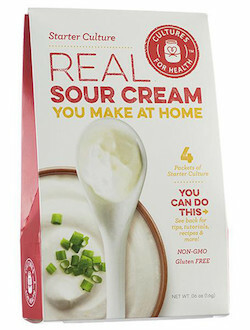 But the best reward: your homemade sour cream contains probiotics and it tastes absolutely delicious! If you browse the internet, you will find several ways to make homemade sour cream. Some sour cream recipes suggest combining dairy and vinegar to create that thick sour cream texture. But this won't accomplish the same probiotic-goodness that using a starter culture does. Plus, the taste and texture just doesn't compare to anything you find in the store or make in other ways! Ingredients: Milk, live active cultures (Lactococcus lactis subsp. lactis, Lactococcus lactis subsp. cremoris, Lactococcus lactis biovar. diacetylactis and Leuconostoc mesenteroides subsp. cremoris). Manufactured in a facility that also produces products containing soy and dairy. Contains dairy, Gluten-Free, Non-GMO. Use 1 packet of starter culture with 1-4 quarts of cream (store extra packets in the refrigerator). This culture is suitable for use with raw or pasteurized half-and-half or cream. Use 1 packet with 1 quart of cream or half-and-half. Cultures at room temperature at 74-77ºF.